Here are the words to some of our favorite campfire songs. Singing around the campfire is a wonderful family camping tradition. It creates warm feelings and happy memories that last long after the family camping trip is over. Don't worry about whether your voice is perfectly in tune or whether you have the notes just right. Just open your throat and sing - and you'll find that everyone else will join right in. But what if we don't know the tunes? I can give you the words to some great songs - but what if you don't know the tunes? These songs are all fairly well-known. Chances are that someone in your group will know the tune. If not, look on YouTube. There's bound to be a video - or ten or twenty or a hundred! What is a campfire song? If the people in your group want to sing it around the campfire, then it is a campfire song! We like rousing songs with easy words and catchy tunes. Maybe your family prefers Broadway show tunes, or country and western music, or Top 40 hits. Sing them all! Encourage everyone in your group to suggest favorite songs. Do the actions - or make up your own actions. 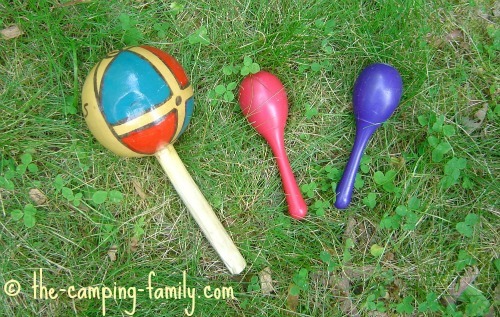 You might want to bring along simple rhythm instruments for the smallest kids. Even if they don't know the words to the songs, they'll be able to make lots of noise! Make sure that each person in the group enjoys at least some of the songs you choose. If you don't know the words to many songs, consider buying a good songbook or two. Here's my favorite. If memorizing words to songs doesn't come easily to your group, stick to cumulative and creative songs. Toddlers and preschoolers love action songs! Even if they don't know the words, they will enjoy doing the actions. And make sure you do the actions yourself! Kids love to see their parents being silly! Most of these songs have easy, repetitive words and simple tunes. If you don't know the actions, just ask your kids! Chances are that they have learned them in preschool, from television or on the playground. Counting songs are easy to learn. Like action songs, they are perfect for the littlest campers. Everyone enjoys silly songs! These will get everyone giggling and set a lighthearted mood for your singalong. A cumulative song is one in which there is a basic structure that is added to with each verse. I especially enjoy these songs because they are so easy to learn. Once you have learned the main part of the song, you just add more pieces. This makes it simple for everyone to learn a relatively long song. These are great songs for singing in the car, too. You can go on singing for a very long time without having to think much! These will get everyone participating. Adding your own words to songs means that you'll end up with a different song every time! These songs have stood the test of time! They have rousing tunes that are fun to belt out with enthusiasm. Here are the words to songs that will be sung by generations to come. Thoughtful words and haunting melodies propelled these songs onto the Top Ten charts and into our collective memories. It's your duty as a parent to make sure that your kids know the words to these songs! A round is a song in which two or more groups sing the same melody - but each group begins at a different time. The melodies overlap perfectly, creating beautiful harmonies. If you haven't yet tried singing rounds with a group, you'll be amazed at the beautiful sounds that you will create! As the evening winds down and bedtime approaches, sing some slow and quiet songs to put everyone in the mood for sleeping. By the time the fire has burned down to embers, you'll all be feeling contented and connected and ready to crawl into your sleeping bags. 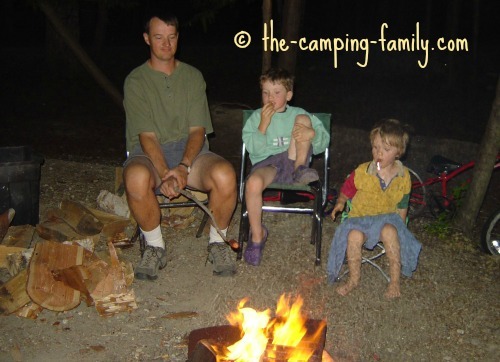 Telling stories around the campfire is a great family tradition, too! Here are some funny short campfire ghost stories, and here's an idea for creating your own funny campfire stories. You certainly don't have to use musical instruments to sing around the campfire. Just sing! But if you are lucky enough to have a guitar player in your group, you are guaranteed an awesome singsong. 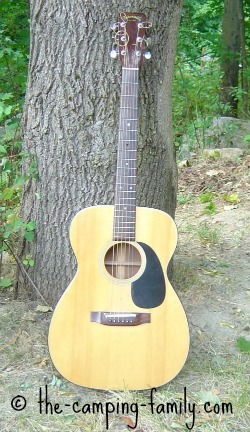 There's something about the strumming of a guitar that encourages folks to sing along. Or perhaps someone can play the harmonica - or the recorder! 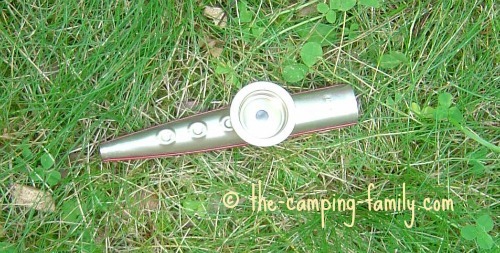 Or how about a kazoo? 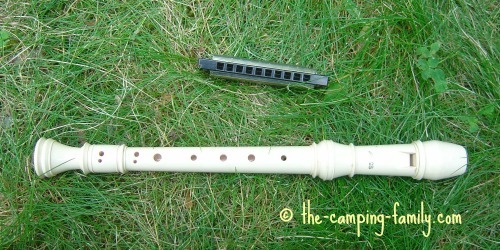 Anyone can play one of these - and they make a great accompaniment to campfire songs! It is certainly not my intention to infringe upon any copyrights. As I understand it, my use of these song lyrics is allowed in accordance with the "Fair Use" provisions of the law. However, if I have inadvertently used any copyrighted material inappropriately, please let me know and I'll either obtain permission from the owners or remove the words. If you want the words to hundreds more songs, I highly recommend Rise Up Singing: The Group Singing Songbook It has the words to just about any song you can name. It includes guitar chords, and has multiple indexes that make it easy to find the perfect song. Now that you have a collection of great campfire songs, visit this page to learn about campfire cooking! Before you leave on your next trip, be sure to visit The Camping Family's home page. There's lots of helpful information for you there!